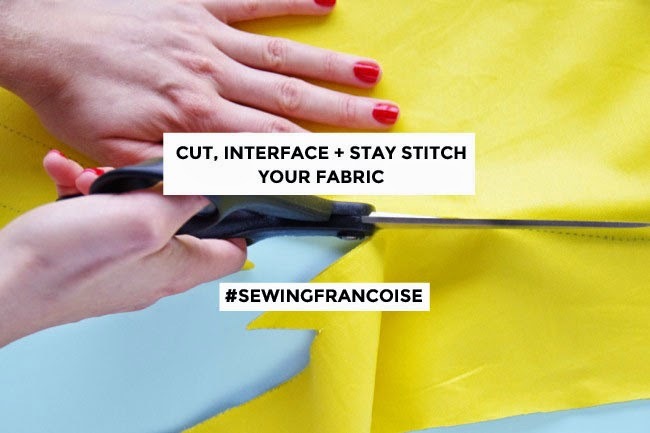 Sewing the Francoise dress? Chosen your size? Checked how it fits you on a toile and made your alterations? Now comes the fun stuff – let’s cut our fabric! Fabric can shrink in the wash, so it’s best to wash and dry it before you cut it out. Once it’s dry, iron out any creases. Fold the fabric in half lengthways, with the right sides together, bringing together the selvedges. The “right side” of the fabric is the side that you want to show on the outside of your dress. The selvedges are the finished edges running down two sides of the fabric. Lay the folded fabric out on a table, smoothing out any wrinkles. Don't worry if your fabric is too long for your table - just roll one end up neatly. If your dress fabric is on the heavy side, it’s a good idea to cut the neckline facings in a slightly lighter fabric to make them less bulky. Similarly, the armhole binding for the sleeveless version works well in medium weight cotton or satin, or you could buy ready-made 35mm bias tape. And if you want to, you can make the collar, yoke or sleeves in a different fabric to your main dress fabric. 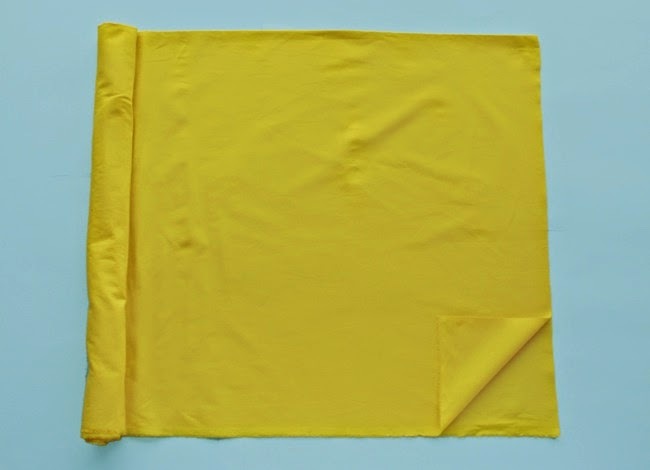 1) Position any lines that say “place on fold” along the fold of the fabric. 2) Line up the grainline arrows (labelled on the pattern pieces) so they are exactly parallel to the selvedges. Stick a pin in one end of the grainline arrow and measure the distance from here to the selvedges or folded edge. Now measure the same distance from the selvedges or folded edge at the other end of the arrow, and pivot it from the pin until both ends of the arrow are parallel. If you’re making the armhole binding, notice that the grainline is diagonal. 3) The list above – and the pattern pieces themselves – tell you how many of each to cut. Because we’ve folded the fabric in half, we can cut two symmetrical pieces at once, or one double piece where the pattern piece is placed along the fold line. If you’re making the collar, note that you need 4 pieces – so you’ll need to lay the pattern piece out and cut it twice. 4) If your fabric has a directional print, make sure you place the pieces with the design pointing the correct way, so it doesn’t end up upside down! Pin the pattern pieces to the fabric or you can hold them in place with some kind of weights, such as food cans, scissors, rulers or whatever you have to hand. Find your pattern size lines – these are marked with a particular style of dashed/dotted/solid line as well as numbers. My favourite way of transferring the pattern lines (just the outlines in your size) to the fabric is by using dressmaker’s carbon and a tracing wheel – read up on how to do that. 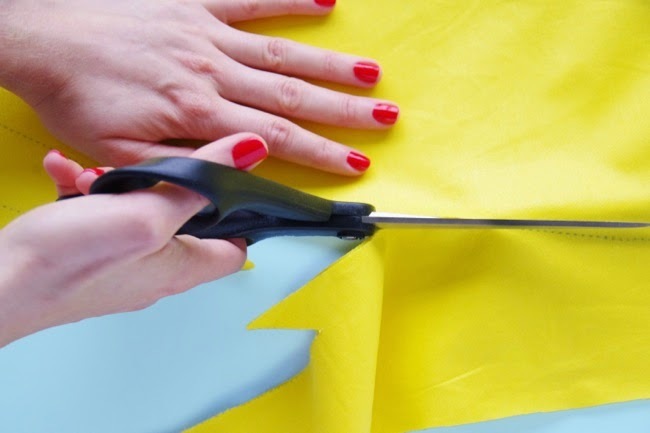 Alternatively, you can cut through the pattern and fabric on your size lines using scissors. Lay down a cutting mat (or some cardboard) if you don't want to mark the table! Next, mark the notches (the little lines perpendicular to the seam lines), darts (labelled on the pattern) and small circles (on the optional tab) on the wrong side of both layers of fabric. I like to use dressmakers’ carbon to do this too. (You don’t need to mark the grainlines or text on the fabric.) Read more on marking and cutting tools and techniques. 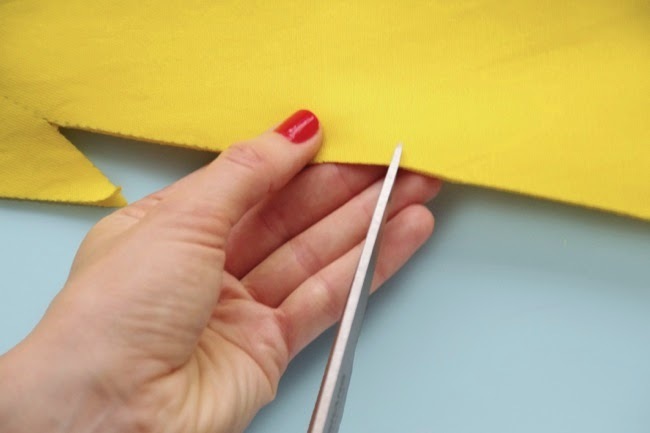 Remove the pattern pieces from the fabric and - if you traced with dressmaker’s carbon - carefully cut directly on the outlines using fabric scissors. The bottom of the waist dart on the front dress sticks out the side a little – take care to cut around it, not into it. I know if looks a bit weird right now, but it’ll make sense later when you come to sew it! Cut short snips for the notches - about 5mm / 1/4in. (Snipped notches are more accurate than those little triangles you may have seen before, and are less likely to distort the edge of your fabric.) Snip an extra notch at the centre of the neckline on the front dress and front neckline facing. These notches will help us match everything up neatly later when it comes to sewing the pieces together. Interfacing is a stiffening material which will give the neckline and optional collar and tab more structure. You can buy interfacing that you sew in, but if your fabric can handle it I recommend the iron-on stuff as it’s so easy to use. (Read more about interfacing.) Apply the interfacing to all three neckline facing pieces and, if you’re adding them, to two symmetrical collar pieces and one tab piece. To apply the interfacing, place the (rough) glue side face down on the wrong side of the fabric and hold a hot, dry iron on top for a few seconds. 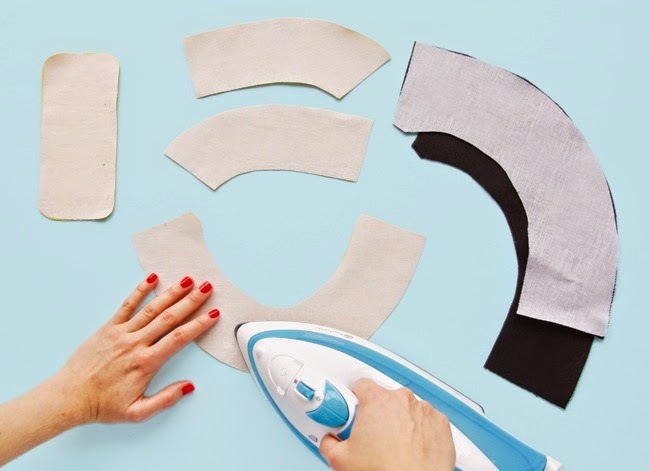 Resist the urge to move the iron back and forth, or you might squidge up the interfacing into a gluey mess. And try to avoid touching the glue side of the interfacing to your iron or ironing board – again, messville! We’re also going to stabilise the curved and diagonal lines on some of the dress pieces by “stay stitching” them – this will help prevent the fabric from stretching out of shape while we’re handling it and sewing with it. With your machine on a normal stitch length (2.2 - 2.5mm), sew a line of stitching 10mm (3/8 in) from the raw edge at the neckline and raglan seam lines on the front dress, back dress, front sleeve/yoke (depending on which version you’re making) and back sleeve/yoke. 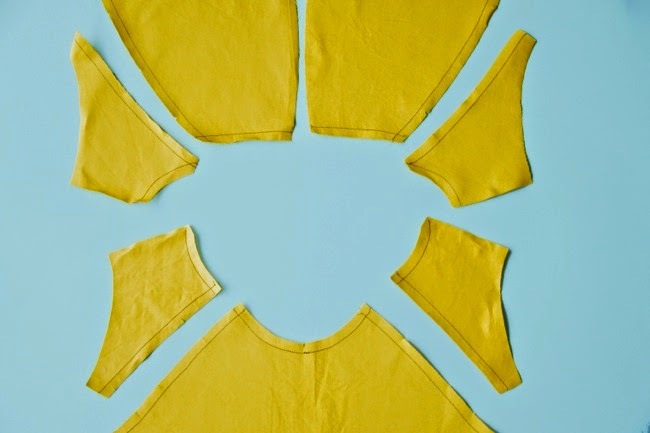 Try to sew in the same direction on each piece so that if any of them stretch a little during under the sewing machine, they all go the same way - so start each line of stitching from the shoulder. When you stay stitch the neckline on the front dress, sew from one shoulder to the centre (marked by the notch you cut earlier), then from the other shoulder to the centre. Want to enter your Francoise dress into the contest to win a Janome sewing machine or fabric shopping vouchers? 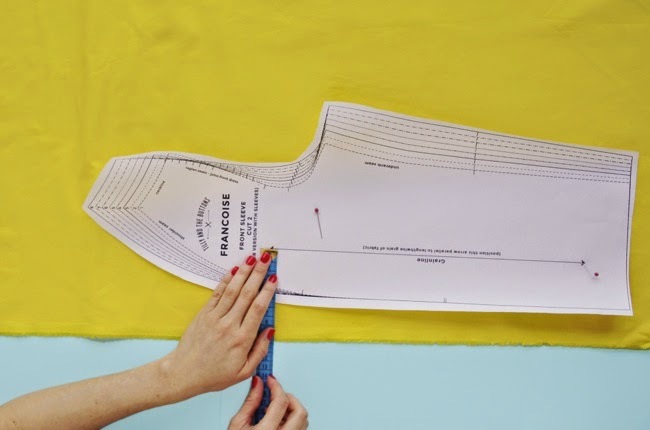 Upload your photo somewhere online (Pinterest, Twitter, Flickr...) with the hashtag #SewingFrancoise and email a link to your photo to lookwhatImade@tillyandthebuttons.com by midnight GMT on 14 December 2014. Please check the full details of how to enter. I can't wait to see what you're making!